I went for a quick holiday to my home town Helsinki last week and managed to squeeze in quite a few restaurant visits! All of these places serve amazing vegan and veggie options, but they are also great if you’re a meat eater or a veggie dining out with non-veggies. There’s so many different types of options in each place, which means everyone can (probably) find something that they like. Kalevankatu 6, 00100 Helsinki, FinlandAfter having dinner at Putte’s last week I’m now convinced that they do the best pizza in Helsinki. The pizzas have this amazingly thin and crispy base that stays together really well, plus a lot of innovative topping combinations such as ALL the local Finnish cheeses and North African spices mixed with pulled oats (an alternative to pulled pork!). I went in thinking they only served one kind of vegan pizza (my favourite, the lovely marinara), but to my surprise they also had another one on their daily specials list. I’m not sure if one of their specials will always be vegan, but I do hope so because the one I ended up having was so good. 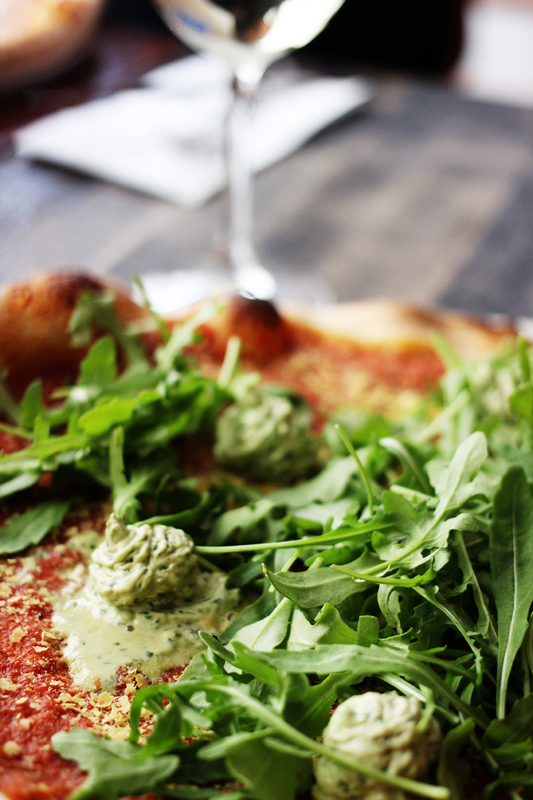 The vegan daily special (aptly named Meat is Murder) had lots of amazing toppings – the dough was topped with yummy marinara sauce, some kind of magical herb butter and nutritional yeast, and then finished off with a generous handful of rocket. The finished product was so good that I polished off the entire pizza in a matter of minutes. Please go if you get the chance! The fact that Friends & Brgrs had a vegan option at all was a bit of a surprise to me. It’s a small chain of slightly posher fast food restaurants serving burgers, fries and milkshakes, but before I knew better I thought it was just another dirty, meaty, McDonalds-type place. Luckily it turned out that I was pretty wrong! I went in expecting to maybe find one vegetarian option, but, as you might have guessed already, next to the token veggie burger they also happened to do a vegan option – yay! You can also get your burger on gluten free bread, and all their meat patties are gluten free as well. My burger came with a vegan patty, onions, rocket, tomatoes and vegan aioli. You could also add other toppings for a small surcharge starting with 50 cents – I added jalapenos which added the perfect kick to the burger. You can order the burger on its own or as a meal with drinks and fries. I would definitely urge you to go for the meal as the fries are amazing. They are handmade, perfectly salted AND triple cooked. I’m actually dreaming of them right now! This is the only place out of this list that I was already familiar with before. Tamarin already had a few branches around Helsinki when I lived there, and it seems to be one of the few things that haven’t changed. The branch I always seem to go to is probably also the least “cosy” as it’s part of a shopping centre bang on in the centre of the city. This might make it a bit more noisy and chain like, but it’s also why it’s one of the best options for food if you’re on a bit of a shopping spree and need a bite to eat. 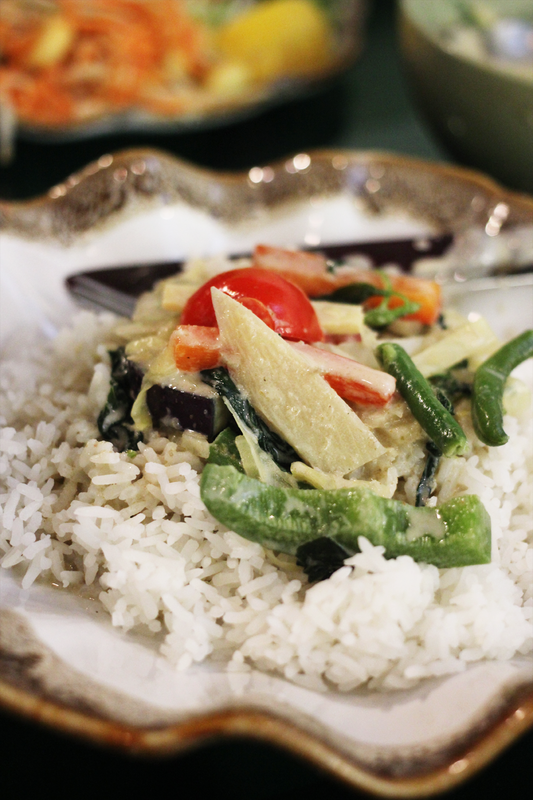 I went for, as I always do, the veggie green curry. I’ve had it before, so I knew what to expect, and I didn’t have to be disappointed this time either. It’s not the best green curry I’ve ever had, but it does the trick very nicely, and the portion is very generous too. Also, just a little heads up: in the menu the curry is marked with 3 chillies which means it should be super spicy, but I didn’t think it was that bad at all – it’s the probably made for the Nordic tastebuds! The menu says that any dish in the menu can be had as a vegan version, but you just have to ask, as otherwise they might add fish sauce to it. This means there’s SO much to choose from, which makes this place such a great option for your mid-shopping food needs! Have you been to Helsinki? If not, what are you waiting for? !